Teaching quantitative methods and data analysis can be tedious, but I have found that using sociological and “headline-relevant” data, such as the 2016 data on police use of lethal force can increase the engagement and learning of our students. The Guardian newspaper has been keeping tracking of US citizens shot by police since the beginning of 2015. The annual data is downloadable and a great free dataset for teaching not only on the topic of race and the use of lethal force by police, but also Excel and SPSS data analysis. Here I provide a downloadable data set for 2016 (up to August 2nd) and an introductory Excel assignment (one I use on the first day of lab before moving onto SPSS). Feel free to adopt or adapt the assignment to the needs of your own class. Stay tuned for an SPSS version. 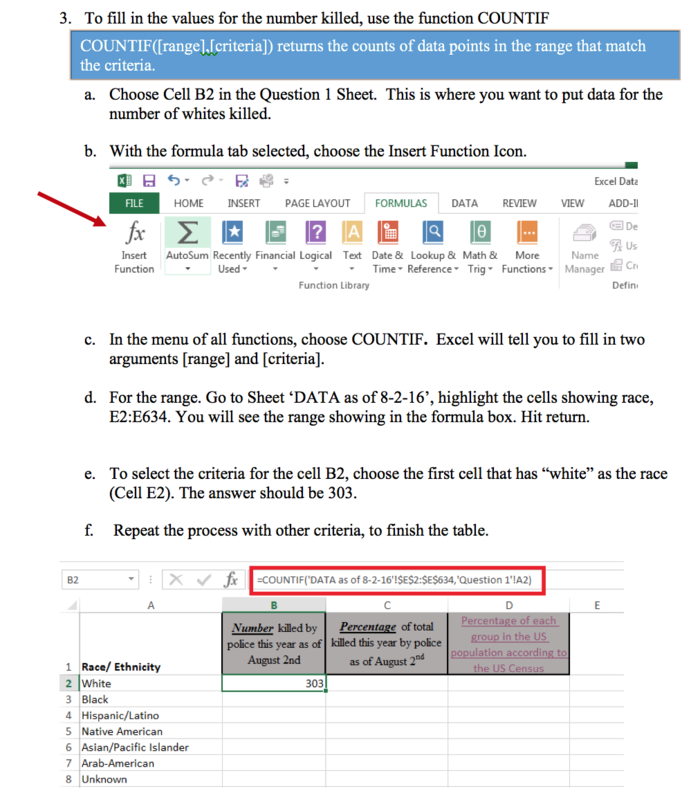 Casey Oberlin and the Data Analysis and Social Inquiry Lab (DASIL) at Grinnell College created an instructional handout to assist students and instructors with this assignment on teaching Excel with police use of lethal force data. The handout includes screenshots and precise instructions to navigate the assignment. Download the handout here.